The economy cost George H.W. Bush a second term. Will the same happen to Trump? George H.W. Bush (left) and Jimmy Carter (right) were one-term presidents. One and done? George H.W. 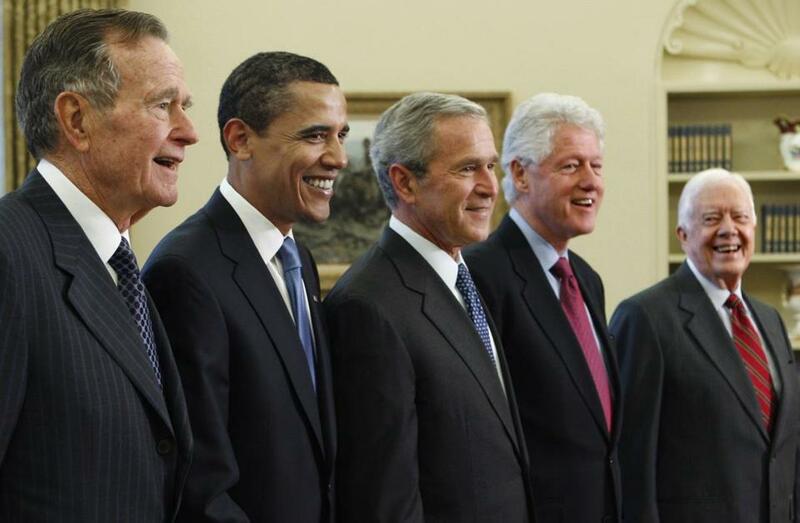 Bush was a one-term president, like Jimmy Carter and Herbert Hoover before him. His popularity soared after the end of the Gulf War, but then the economy sagged into recession. Still, he just might have beaten Bill Clinton in 1992 if employment had picked up before Election Day rather than just after. It’s an episode worth revisiting as we remember Bush’s long service to the country, given the uncertainty surrounding today’s economy, and his one-term presidency provides some context for President Trump’s obsession with trade and jobs, the Federal Reserve, and oil prices. 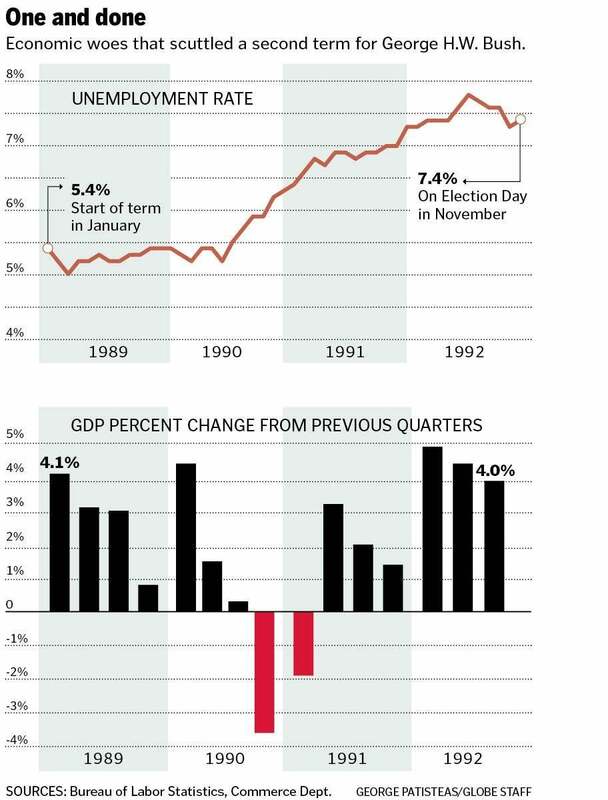 Bush 41 inherited the Reagan bull market and extended economic expansion. But growth began to sputter in mid-1990 and contracted in the final quarter of that year and the first quarter of 1991. The spike in oil prices after Iraq’s invasion of Kuwait and rising interest rates undermined business and consumer confidence. Unemployment, which stood at 5.4 percent when Bush was sworn into office in January 1989, peaked at 7.8 percent in June 1992, even though economic growth had resumed. It was a jobless recovery, and while the Bush recession had been relatively short and mild, it gave Clinton — and independent candidate Ross Perot (Remember the ears! The charts!) — an opening to pound away at the incumbent’s performance. “The economy, stupid,” is how Clinton strategist James Carville summed up the campaign’s key theme. OK, so what’s this got to do with Trump? Potus 45 also inherited a healthy economy and bull market, but they have held up so far. And where Bush cut a deal with Democrats to raise taxes (abandoning his “Read my lips, no new taxes” pledge), Trump cut taxes and juiced growth. His economic record so far is stronger than Poppy’s. But cracks are starting to appear. The stock market is struggling, interest rates are rising, and while the jobless rate is at a record low, there are millions of people who have just plain given up looking for work, with little evidence that the president has been able to provide a meaningful boost to the blue-collar manufacturing, steel, and coal workers he vowed to help. Think what you like of Trump, but he knows that no economy — or stock market — goes up forever. And he is deeply unpopular beyond his extremely loyal base. That’s why, despite the murder of a dissident Saudi journalist and US resident Jamal Khashoggi, Trump hasn’t responded with sanctions, and has even said he believes Crown Prince Mohammed bin Salman’s denial of involvement in Khashoggi’s brutal death. He needs the Saudis to keep oil prices from spiking too high (which would croak the US economy) or falling too low (which would hurt US producers). It also explains why he has repeatedly criticized Fed chairman Jerome Powell for continuing to hike interest rates, which has unsettled chief executives and investors, and pushed relentlessly for higher trade tariffs against the Chinese, which strikes a populist chord and — unlike his hard-line stance on immigration — has the support of some moderates and progressives who agree that China is behaving badly. Call it Trumpian real-economics. Sure enough, things seemed to go Trump’s way over the past week when Powell said the central bank may largely be done tightening credit, and China allegedly made some modest concessions — and the United States agreed to hold off on further tariffs — while they try to hash out a deal. Still, put the Russia investigation aside for the moment. A lot could go wrong with the economy between now and 2020. Even a Trump supporter should know that there is more than a slight chance that Trump ends up a one-term president. When the economy goes south, voters can turn surly. George H.W. Bush learned that the hard way.